Sookdeo Bissoondoyal was born on 25 December 1908 in Tyack, Rivière des Anguilles in the south of the island. He was a primary school teacher, journalist, prolific writer, parliamentarian, Government Minister and Leader of the Opposition who helped to shape the history of modern Mauritius. During his long and distinguished life of public service, he struggled for social justice, the right to vote for his fellow citizens, the protection of their civil rights and for poverty alleviation. He founded the Independent Forward Bloc, and was instrumental in the creation of the Jan Andolan (People's Movement) which initiated campaigns in order to fight for the social and political rights of the poor. "We all know how hard a country has to struggle before it establishes its identity. We know equally that a proper education is an integral part of that struggle." This statement of Sookdeo Bissoondoyal clearly shows that one of the major objectives of his life-long struggle was promoting the education of the Mauritian people. He firmly advocated and fought for free access to education for all children irrespective of their social background. Between the 1920s and 1970s, he taught more than three generations of Mauritians with some among them eventually playing an important role in the country's history as public and political figures. Furthermore, during the 1940s and 1950s, he initiated campaigns to safeguard and expand the educational opportunities of young Mauritians. As an influential member of the Legislative Council and later on of the Mauritian Parliament, Sookdeo Bissoondoyal fought hard to secure social welfare programs for the poor and was against corruption and the abuse of power in the civil service. In 1965, Bissoondoyal attended the London Conference where he helped Sir Seewoosagur Ramgoolam make the case for Mauritian independence. At the same time, he is also credited with coining the term "Parti de l'indépendence" or Independence Party. During his political career, which lasted almost three decades, Sookdeo Bissoondoyal served as the Minister of Local Government and Cooperative Movement, a Member of Parliament, Leader of the Opposition and as a party leader. Sookdeo Bissoondoyal passed away on 18 August 1977. The two stamps affixed on the Special Commemorative Cover are the 40 cents and the Rs16 stamps of the Inland Transport ans Stone Buildings sets respectively. The 40 cents stamp shows the Rivière des Anguilles bridge, located close to the birth place of Sookdeo Bissoondoyal. The Rs 16 stamp depicts the Carnegie Library, Curepipe, symbolising the value the latter gave to education. 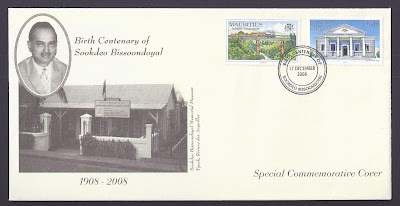 The illustration on the cover shows a portrait in medallion of Sookdeo Bissoondoyal as the Minister of Local Government and Cooperative Movement with a background picture of the Sookdeo Bissoondoyal Memorial Museum in Tyack, Rivière des Anguilles.